This year’s ESPYS awards, I believe, have the potential to begin a very public conversation, and then negotiation, regarding race and law enforcement across the country. Led by Carmelo Anthony, LeBron James, Dwyane Wade, and Chris Paul stood together at The ESPYS to protest the disproportionate shootings of unarmed black men by police officers in black communities and the retaliatory shootings of police officers. This unified front – four of the best and most popular black athletes in the world – on the largest issue of racial divide in our country today, signaled a sea change in how influential black athletes can be in helping communities, and, subsequently, the nation, address issues of social justice. Can this specific protest initiate any action toward the change that is desperately needed? Watching this moment on TV reminded me of a conversation then-NBA Commissioner David Stern and I had with anti-apartheid leader Nelson Mandela during a visit to South Africa in 1993. This was before his presidency, during a time of upheaval there, amid the racial violence associated with dismantling apartheid. We’d been invited by him to offer hope to South Africa’s youth through sports. NBA players Patrick Ewing, Alonzo Mourning, and Dikembe Mutombo made the trip, and the highlight was dinner with Mandela. After his speech, followed by mine on behalf of the NBA/National Basketball Players Association delegation, we engaged Mandela in a conversation about race. We discussed the parallels between his work and civil rights leader Martin Luther King Jr.’s work in the United States to bring the races together. He spoke of the courage needed for social change, as well as the leadership qualities and the tremendous capacity for love required to make those changes happen. Mandela and King are always leaders who come to mind when we think about advances in race relations, and rightfully so: Few others have enabled such progress and success. What should encourage us all about Anthony, James, Wade, and Paul is their compassion, their unselfishness, and their willingness to participate, as agents of change, on an issue much larger than themselves. 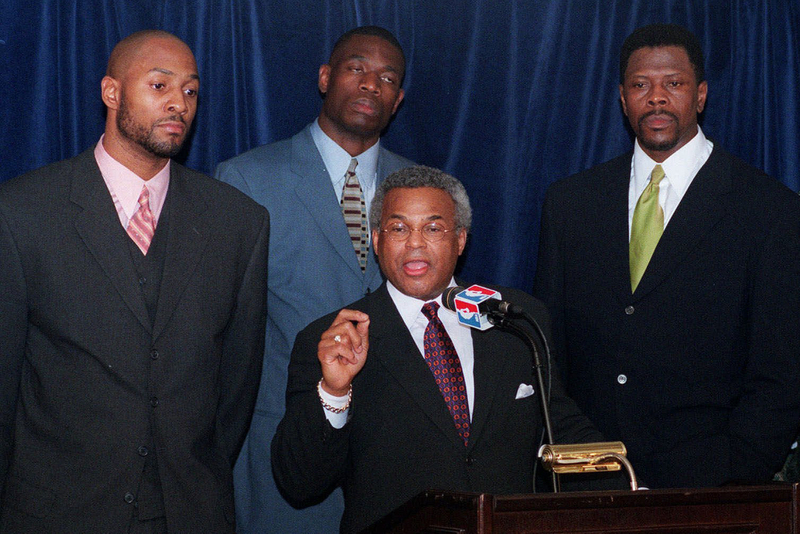 National Basketball Players Association leader Billy Hunter speaks to the media, backed up by Alonzo Mourning (left), Dikembe Mutombo (center), and Patrick Ewing (right) after negotiators failed to reach an agreement in the NBA lockout talks on Dec. 3, 1998, in New York. As I read Anthony’s statement and saw its accompanying photo of athletes Jim Brown, Kareem Abdul-Jabbar, and Bill Russell taking a stand in support of boxer Muhammad Ali’s refusal to enter the armed forces in 1967, I was not only reminded of the powerful messages delivered by these players who preceded Anthony. I was struck by how, given the insularity in which we lived then, though the athletes were willing, their ability to effect large-scale change was limited. However, given social media, today’s athletes are uniquely positioned within, and supported by, a confluence of forces that can effect change. Given the powerful triad of the visual, the global and the immediate, black athletes can have significantly more power today than they did in 1967. These stars possess the same passion for change, and embody the same traits as their predecessors but, finally, they have the means to initiate change in their communities. The question is simply this: How? When Anthony, James, Wade and Paul were joined by another champion, Olympian and WNBA New York Liberty’s Tina Charles, in protest, they realized that they were seeking to change the status quo by creating a movement using a gender-inclusive sports platform as a catalyst. Many of our athletes grow up in black communities, and, as black men and women, have experienced their own confrontations with law enforcement. That they are willing to take a personal stand is both significant and timely, as the violence against young black men, initiated by police, and now retaliatory violence, has created a national crisis. While these athletes are not able to create legislation, they have the ability to unite and inspire those in institutions who can. Mandela and King were able to bring about change by engaging whites and blacks together, yes, but also by demanding the cooperation, and finally the support, of the institutions that possessed the power to help them achieve their goals. So the second phase, the negotiation, begins with the sports institutions themselves. The biggest challenge to the leadership of professional sports leagues is to determine which outside forces may negatively affect their businesses; specifically, the owners’ bottom line and, most importantly, franchise values. These institutions have the organizational structure and political clout that is pivotal to Anthony as he continues his protest. These athletes need to be more than merely complimented on speaking out on social issues: They need the support of basketball. Instead, there is largely silence. On the ownership side, only Isiah Thomas, through his work against gun violence in Chicago, and Michael Jordan, through his financial contributions to build trust between law enforcement and the black community, have been vocal. I expect more from the NBA; it can, again, set the tone for other sports institutions, and all of America. Ownership is showing its racial politics again, as they did when they failed to unanimously vote for Donald Sterling to lose his Los Angeles Clippers franchise. Adam Silver, NBA commissioner, on behalf of the NBA, the WNBA and USA Basketball, should meet with Anthony, James, Wade, and Paul, along with Charles, and their respective unions, and engage in a principled discussion (not collective bargaining) about race, law enforcement and attendant violence in black communities. 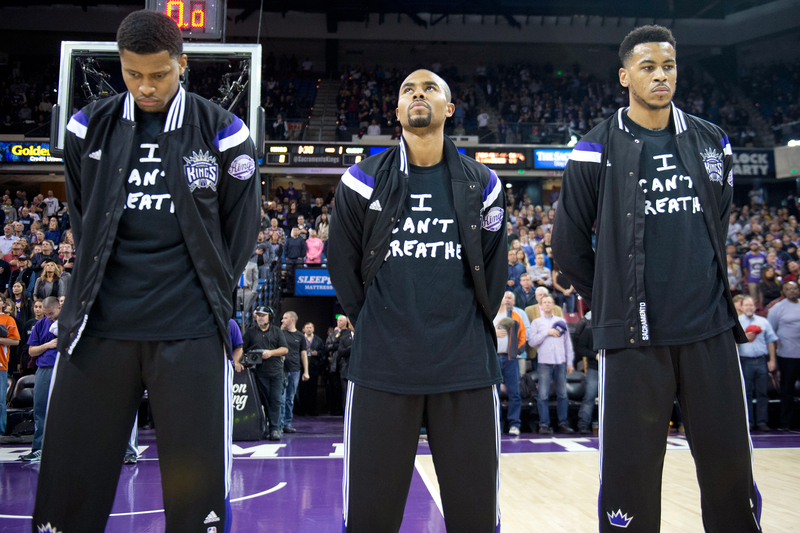 Sacramento Kings players (from left) Rudy Gay, Ramon Sessions and Eric Moreland wear shirts that read “I can’t breathe” in memory of Eric Garner during the national anthem before the game against the Houston Rockets on Dec. 11, 2014, at Sleep Train Arena in Sacramento. The NBA, given 80 percent of its players are black, cannot ignore racial injustice. As partners they can engage the communities, through their local franchises, using player appearances, as already defined in the collective bargaining agreement, to bring governors, state senators, mayors, police chiefs, civil rights organizations and representatives from Black Lives Matter together to explore local, workable solutions. This can be organized under the already existing NBA Cares initiative, enabling players to unite and inspire their respective communities. It should be agreed that these discussions would have no linkage to the current collective bargaining discussions for the upcoming labor agreement. When the Dallas Chief of Police David Brown said law enforcement was overloaded and pleaded for help, where were our sports organizations? Many of our cities’ police departments need resources. Anthony should know that when the Olympics were professionalized in 1992, the first “Dream Team” received one-third of revenue earned by USA Basketball in return for the use of their likenesses. Jack McCallum’s book Dream Team cited that revenue as being between $600,000 and $800,000. Using the average of $700,000, it is $1.3 million in today’s dollars. While most of the team donated their shares back to USA Basketball, I insisted they receive it precisely so they could donate to a charity of their choosing. That condition no longer exists, but, if it did, this year’s team members would be in the position to add resources to their protest. Finally, professional sports leagues, the NCAA and, particularly the Power Five collegiate conferences as corporate citizens cannot continue to seek antitrust protection as well as use public funds for stadiums and arenas, and not have the ethical and moral responsibility to engage in the welfare of the citizens in these communities. This is particularly true given that the majority of its athletes could find themselves in the same danger, at any traffic stop, as any of the other unarmed young black men killed so far this year.